Imagine if making one small mistake and insulting the wrong person could cost you your freedom. This happens to Aisha Saeed's heroine Amal, who disrespects the wealthy landowner in her Pakistan village and ends up an indentured servant to him indefinitely. 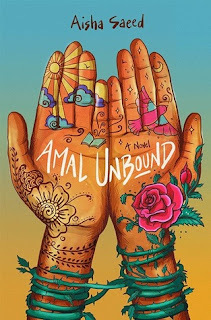 Ripped from her family, Amal must learn who to trust and try to do her best in her new life, while keeping hope that she can someday be a teacher and return to her family. I can't remember reading any other books set in Pakistan, so I was eager to learn more. The culture is incorporated really well; Saeed keeps it authentic without forcing translations upon her readers. If you don't catch what a word means, it's okay. My only issue with the book is the extremely saccharine ending. I know this is a middle grade novel and needs to have a happy ending, but this was a bit much. I feel it was so unrealistic that it did a disservice to the young readers who are encountering situations like indentured servitude for the first time, as well as not honoring the many people who live like this.